Historically, Belgium, the Netherlands and Luxembourg were known as the Low Countries. Brussels, one of the greatest cities in Europe. The heart of the historical city is the Grande Place, a magnificent collection of guildhouses and the decorative town hall. Brussels has much more to offer than the Manneken Pis and Eurocrats. Antwerp has character. Diamonds, chocolate and the big cathedral. But Antwerp is also all about fashion, design, music. It is Belgium’s best-kept secret: Art, history and very inspiring. Traditional and modern: The impressive MAS Museum and the gothic cathedral. The Grote Markt is beautifully surrounded by the Town Hall and the houses of the Guilds built in 16th century. Another highlight is the Cathedral of Our Lady. It contains works by the Baroque painter Peter Paul Rubens. Bruges is the number-one postcard destination. Sometimes, like Amsterdam, called ‘Venice of the North’. The little bridges and the parks make you feel like in medieval times. A little city of canals and bridges and medieval Flemish architecture. The best way to see the city is by foot or from a horse drawn carriage. Ghent is a small city with 297 bars, 50.000 students, an alive music scene with free concerts every day. The Graslei is one of the most scenic places in the old city centre. Flanders is the Dutch-speaking part of Belgium. Flanders Fields shows also the key sites of World War I including battlefields, bunkers, and the town of Ypres. If you join us on one of our Belgium Tours from Amsterdam, Holland Private Tours can pick you up at Amsterdam Airport, or your hotel. 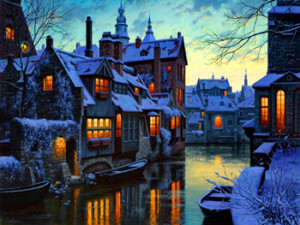 Belgium Tours from Amsterdam: Bruges. Important to know is that the drive to Bruges is 2,5 to 3 hours. But absolutely worthwhile! With our Mini Bus 8 seater. Perfect for small sized groups.